Air Canada has decided to launch non-stop service between Toronto and Dubai, beginning on November 3, 2015. The airline will operate the route three times a week, using Boeing 787 Dreamliners. 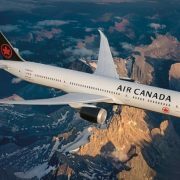 The new route will be the first to be operated primarily by Air Canada’s Boeing 787-9 widebodies, according to the airline. The Indian subcontinent is currently the largest international market not served by Air Canada. The order, which the manufacturer values at $6.5 billion at list prices, consists of 33 Boeing 737 MAX 8 aircraft and 28 737 MAX 9 jets. Air Canada has also secured option on 18 more 737 MAX aircraft and rights to purchase another 30 737 MAXs.